Saturday, July 16th was an emotional, festive, and memorable day and the highlight of our time in San Pedro. 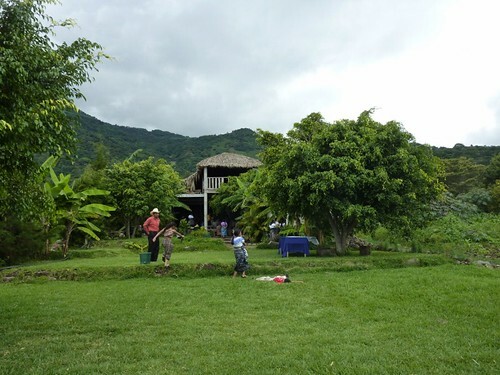 Again this year we had a celebration party for all the Beca students and their families – we pick up the tab and the Cooperativa teachers plan the menu and do the shopping, cooking, and serving led by Lorenzo’s wife, Andrea. 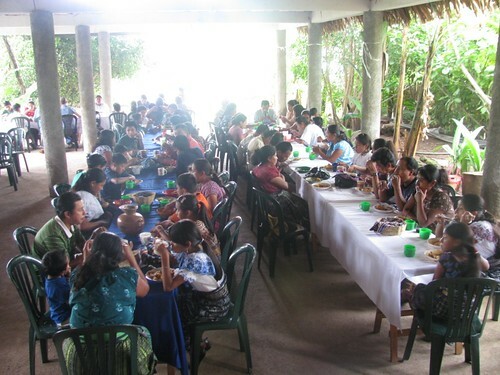 Last year there were more than 60 people in attendance and we held the dinner at the Cooperativa school. This year the guest list had grown to more than 120 so we moved the event to a large, wonderful venue just outside of town on the lake. Led by 2 of the fathers, the kids prepared a cultural presentation for our viewing and listening pleasure. 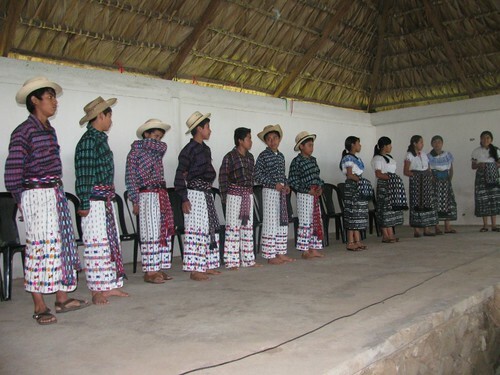 First up was a cultural song with parts for the girls and the boys separately and together; the girls are wearing their school uniform skirts with their most festive blouses; the boys are wearing the traditional male attire in the village, usually only seen on older men except for special occasions. 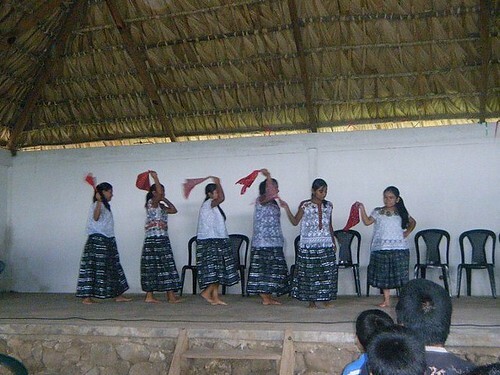 Next was a beautiful traditional dance depicting the trading of goods in the market. 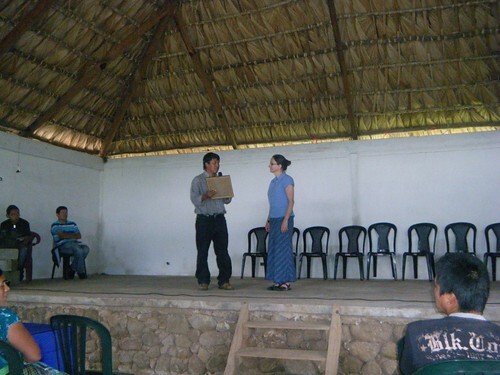 That was followed by a detailed and well-rehearsed play showing the traditions of courtship and marriage in San Pedro, complete with grilling the young couple, lots of prayers, exchanges of food, and circuits of apologies at the request of the elders by the couple for causing so much trouble. 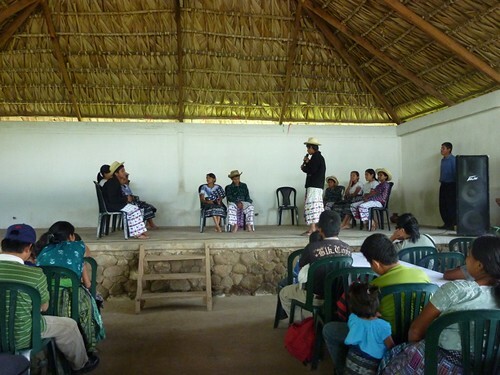 Because the play was conducted in Tz’utujil, Mynor explained the process to us ahead of time. 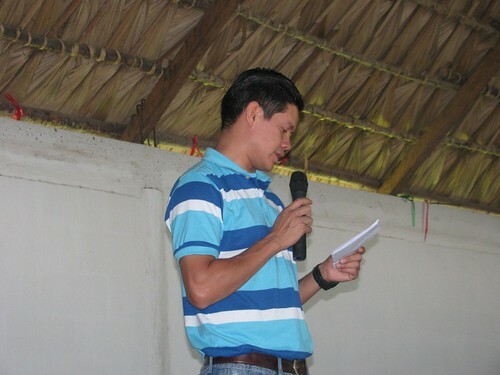 Occasionally the audience roared with laughter and we laughed along. Apparently the funniest bits were the “groom” answering in less than enthusiastic terms. 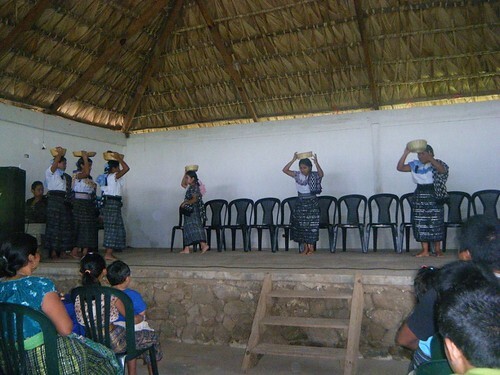 The final performance was another traditional dance. 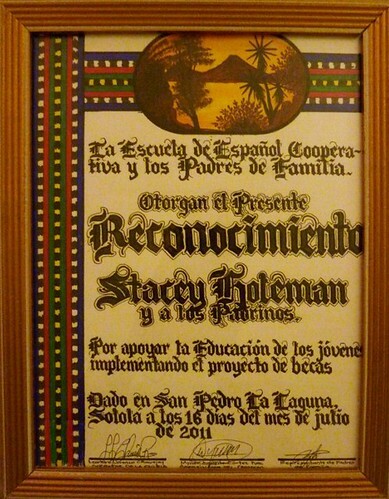 …and Lorenzo presented me with a beautiful hand painted plaque in recognition of the impact of the Beca Project in San Pedro. It instantly became one of my most prized possessions. Time for lunch!! 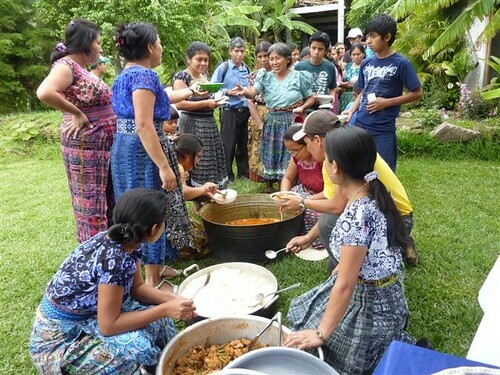 The families had been asked to bring their own tortillas and plates or bowls. 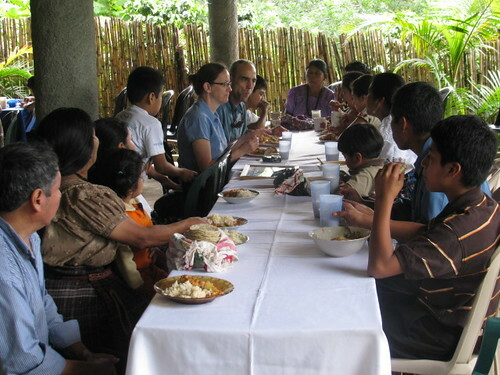 The Cooperativa staff served rice with chicken and vegetables and a savory pepian sauce, enjoyed by all. After posing for photos we said goodbye to all our Beca friends, receiving hugs and kisses from nearly everyone there. I’m practically counting the days before I head back! You can check out more photos from the event here; there’s a slideshow link above the set to the right. Happy trails! What an honor. I wish I could have been there. I am sure you must have been more than blessed, as are all those lives you have touched. Hopefully, I can be on the next trip.